While there may be only one organism that causes oral thrush, the reasons why this happens may be different from case to case. For instance, adults may get oral thrush after they’ve had a long course in antibiotics, while babies may get it at birth, when they come in contact with vaginal candida. 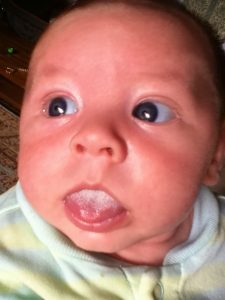 In this article, we’re going to deal with the causes of oral thrush in babies, as well as in healthy and diseased adults. Newborn babies are most likely to get oral thrush at birth, especially if the mother carries vaginal candida. If this happens, babies will show the first symptoms within ten days. However, not all babies get candida albicans at birth, and not all who do eventually develop thrush. In fact, it’s not completely clear why babies develop thrush at all, since candida is often present in their mouth without causing any problems. However, candida in newborn babies is definitely related to their underdeveloped immune systems. Just like adults, babies may also develop thrush if they’ve been treated with antibiotics. Such medication courses affect the healthy bacteria in the mouth and increase the number of candida albicans. Unlike oral thrush in adults, the condition is not uncommon in babies and it will normally go away without treatment. However, if it persists for more than two weeks, you should seek medical help. By healthy adults we mean people who don’t suffer from a serious condition such as AIDS, cancer or diabetes. These conditions weaken the immune system, thus making it more likely for the candida to grow into thrush. You should know that most people normally have candida in their mouths. It only becomes infectious when it grows out of proportion – a process called candida overgrowth. There are some diseases that are commonly associated with oral thrush, since they have a serious negative impact on the immune system. The most common are AIDS, cancer, and diabetes. AIDS exposes you to many illnesses that your body would normally fight off, and oral thrush is one of them. In fact, repeated instances of thrush may be an early indication of AIDS. Cancer treatments such as chemotherapy will also weaken your immune system, thus making you more vulnerable to thrush. If you have diabetes, your saliva may contain large amounts of sugar. This can also cause the candida to grow into thrush. Oral thrush is normally caused by a common oral fungus, candida albicans. Because the main cause of oral thrush is a weak immune system, babies develop it most frequently – their immunity is still underdeveloped. Adults suffering from severe immune system disorders may also develop oral thrush, for basically the same reasons – not enough resources to prevent candida overgrowth. In healthy adults, this condition is quite uncommon, and it is usually associated with poor oral hygiene, extensive use of antibiotics, or smoking. Luckily, there’s a lot you can do to manage thrush from babies to adults.